Something about the dreary days we've been having has really made me want some COLOR. You know, eat the rainbow! Plus, I had just made an amazing haul at my local market, where I found beautiful rainbow carrots, purple cauliflower, huge fennel and golden beets, so naturally I had to use them all at once! This nutrient-packed salad is great on it’s own as a dinner salad, or served alongside a nice roasted chicken! Toss the potatoes with up to 2 tbsp olive oil, 1 tsp sea salt, 1 tsp garlic powder, 1/2 tsp dried basil. Toss the cauliflower with up to 2 tbsp olive oil, 1 tsp sea salt, 1 tsp garlic powder, 1/2 tsp dried basil. Divide the remaining oil and seasonings across the beets, carrots and fennel. Place the cauliflower, carrots, and beets/ fennel on separate baking sheets. 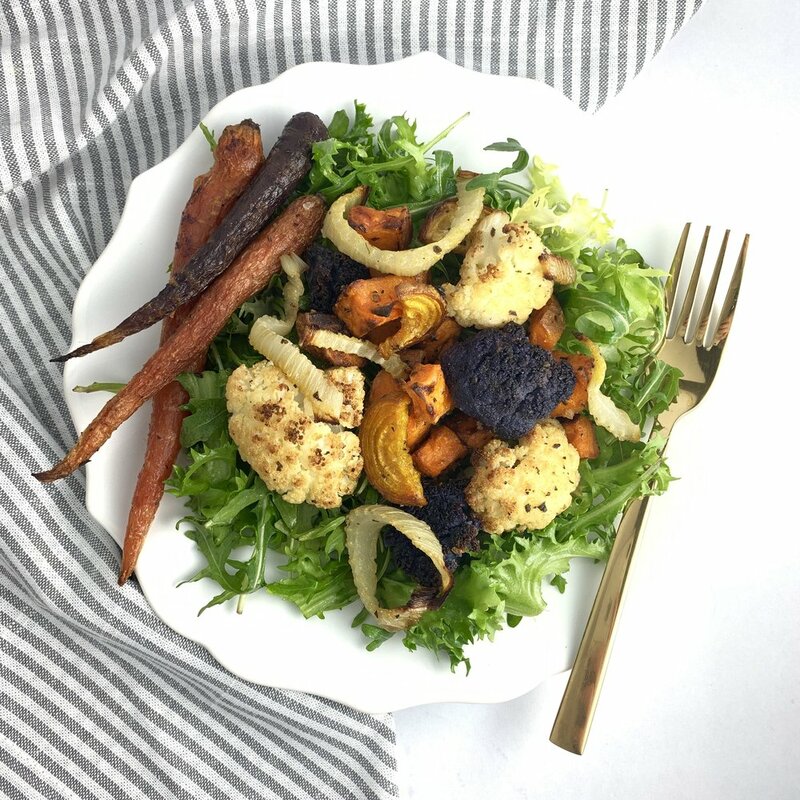 Roast veggies for 30-35 minutes (carrots may need to go an extra 10 minutes. On a serving dish, layer the arugula/endive mixture and veggies.